What Are Causes of Primary Congenital Glaucoma? What Are Primary Congenital Glaucoma Symptoms? What Are Primary Congenital Glaucoma Signs? When Should Someone Seek Medical Care for Primary Congenital Glaucoma? What Exams and Tests Do Health-Care Professionals Use to Diagnose Primary Congenital Glaucoma? What Is the Treatment for Primary Congenital Glaucoma? Is Follow-up Necessary After Treatment of Primary Congenital Glaucoma? Is It Possible to Prevent Primary Congenital Glaucoma? What Is the Prognosis of Primary Congenital Glaucoma? Where Can People Find More Information on Primary Congenital Glaucoma? By definition, primary congenital glaucoma (PCG) is present at birth. It is usually diagnosed at birth or shortly thereafter, and most cases are diagnosed during the first year of life. PCG is characterized by an abnormality in the development of the eye's drainage channel (a structure in the eye called the trabecular meshwork). A clear fluid called aqueous continuously flows within the eye from the area behind the iris where it's secreted to the sieve-like trabecular meshwork where it drains back into the bloodstream. Because the trabecular meshwork does not function properly in PCG, the aqueous outflow is impaired, resulting in high pressure inside the eye. This elevated intraocular pressure can result in damage to the optic nerve (glaucoma) and may result in permanent vision loss if not treated promptly. Most cases of primary congenital glaucoma occur sporadically. However, some cases are genetic and therefore inherited. In these cases, genetic testing of the parents and siblings of the affected child may be considered. Elevated eye pressure can put pressure on the wall of the eye and cause expansion. The eye may appear enlarged. This is called buphthalmos. The cornea (the clear front layer of the eye) can also become cloudy, appearing whitish-grey. Depending on the child's age and level of cooperation, some of the examination can be performed in the office. In infants, the examination is often less challenging if performed when the infant is relaxed or drowsy, such as during feeding or shortly after. In most cases, additional examination and testing will need to be performed under sedation or anesthesia, and arrangement can be made to treat at the time of diagnosis. Vision is checked. In an infant, this may be limited to checking if he/she can fixate on an object and follow a moving object with the eyes. Refraction is measured. This is a measurement of nearsightedness, farsightedness, or astigmatism. In PCG, the high eye pressure can produce nearsightedness (myopia) resulting from an increase in the eye's length and astigmatism resulting from scarring or swelling of the cornea. Tonometry to measure the eye pressure: This measurement of the eye's size determines if it is enlarged (buphthalmos). The diameter of the cornea is measured using calipers, and the length of the eye is measured using A-scan ultrasound. Examination of the cornea checks for cloudiness and small breaks on the back layer (called Haab's striae) that are sometimes present when the cornea is stretched under high eye pressure. A measure of the cornea's thickness (pachymetry) might also be done. Direct visualization of the trabecular meshwork: This is called gonioscopy and is performed with special contact lenses and mirrors. This test is important to determine if the angles (the area where the trabecular meshwork is located) are open, narrowed, or closed, and if other conditions such as scar tissue in the angle are present. The optic nerves are carefully examined (using ophthalmoscopy) to look for signs of glaucomatous optic nerve damage. This may require dilation of the pupils to ensure an adequate view. Fundus photographs, which are pictures of the optic nerve, may be taken for future reference and comparison. Primary congenital glaucoma is almost always treated surgically. Medications in the form of eyedrops are used initially to lower the eye pressure prior to surgery. Other medications may also be used to help decrease the clouding of the cornea in preparation for surgery. Surgery is performed to allow the aqueous fluid to more easily drain back into the bloodstream. The most common surgical procedures for primary congenital glaucoma are goniotomy and trabeculotomy. In both procedures, the ophthalmologist makes an incision across the trabecular meshwork fibers that are impeding the aqueous flow. In goniotomy, the procedure is done by inserting an instrument into the eye and visualizing the angle directly with a gonioscopy lens. This can only be done if the cornea is clear. In a trabeculotomy, the trabecular meshwork is approached via an incision made on the outside wall of the eye; this is the preferred procedure if the cornea is too cloudy for a goniotomy. Goniotomy and trabeculotomy have similar success rates of approximately 80%. If medications and goniotomies and/or trabeculotomies fail to reduce eye pressure sufficiently, the remaining options are to perform a surgery that permits the aqueous to bypass the trabecular meshwork (trabeculectomy, or drainage implant surgery) or to reduce the production of aqueous (ciliary body ablation procedures). In a trabeculectomy, the surgeon creates a new drainage channel that allows the aqueous to drain directly from the inside of the eye to a small pocket of tissue (called a bleb) and then back into the bloodstream, thus lowering the eye pressure. Medications called antimetabolites are sometimes used in conjunction with trabeculectomy to reduce the odds of scarring of the bleb. In drainage implant surgery, aqueous is shunted back to the bloodstream via an implanted drainage device (for example, Molteno, Baerveldt, or Ahmed implants). Ciliary body ablation procedures are usually reserved as a treatment of last resort. In this procedure, the ophthalmologist uses a laser (Nd: YAG or diode laser) or a freezing probe (cryotherapy) to intentionally destroy a portion of the ciliary body, which is the organ in the eye that produces the aqueous. Eye pressure is thus lowered because less fluid builds up inside the eye. Following any surgery, close follow-up is important as, with any surgical procedure, complications may occur. Serious complications may include blood collecting in the eye (hyphema), infection, damage to the lens, uveitis or internal swelling (inflammation), and eye pressure that is too low (hypotony). Because children may also have complications from general anesthesia both eyes may be treated in the same operating room session (bilateral procedure). Frequent follow-up visits are needed after surgery and close monitoring if the eye pressures and optic nerves will be necessary throughout the patient's life. The optic nerve remains vulnerable if the eye pressure begins to rise again for any reason. Additionally, children will need close monitoring of their refractions. If the eye is found to have significant myopia (nearsightedness), hyperopia (farsightedness), or astigmatism, glasses or contact lenses may be used to prevent amblyopia (blurred or lazy eye). If amblyopia is already present, a regimen of glasses or contacts together with patching may be needed. If the cornea, lens, or other parts of the eye are scarred or damaged as a result of the eye pressure, the inflammation (swelling), or the surgical treatment, additional procedures may be necessary, as well. Primary congenital glaucoma cannot be prevented. Many cases are genetic, inherited as a recessive trait, meaning that it might skip generations and may be difficult to trace in the family history. Once suspected, early treatment from an ophthalmologist can reduce the odds of permanent vision loss. The prognosis depends on both the age of onset and the timing of initial treatment. PCG that is present at birth carries the highest risk for vision loss. The most favorable outcome is seen in infants whose symptoms appear between 3-12 months of age and undergo prompt treatment. Thorough treatment includes not just lowering the eye pressure but also promptly addressing any additional factors such as refractive error, corneal/lens damage, and amblyopia. Close follow-up to detect any new complications as they arise will also improve the prognosis. Parents and caregivers must understand that elevated IOP can recur at any age in a child with primary congenital glaucoma. For this reason, regular eye examinations with an ophthalmologist are very important. Support groups and counseling might also be available through various organizations specializing in eye care. 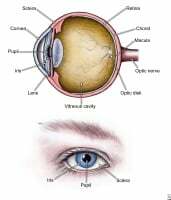 Illustration of parts of the eye. Biglan, A.W. "Glaucoma in children: Are we making progress?" J AAPOS 10 (2006): 7-21. Faiq, M., et al. "Genetic, Biochemical and Clinical Insights into Primary Congenital Glaucoma." J Curr Glaucoma Pract 7.2 May-Aug. 2013: 66-84. Ho, C.L., and D.S. Walton. "Primary Congenital Glaucoma: 2004 Update." JPOS 41 (2004): 271-288. What were the symptoms you experienced from primary congenital glaucoma? What treatment did you receive for your primary congenital glaucoma? Did you undergo surgery for your primary congenital glaucoma? Please describe your experience and the results.